The animals are getting hungry with the deep snow. This fox is eating the food I put out for the Pine Martens, peanuts and sultanas. I has been putting out scraps of chicken and meat when I have them, but the hoodies seem to get there first. Unfortunately for the fox, hoodies don't miss much. Does your camera ever record any interactions between the fox(es) and pine martens? Tried to watch your video but comes up "Private Video". It did the same for me, too... but I like your photo of the sheep in your photostream! What is that shape sitting just to the right of the fox, that looks like either a young cub or a soft toy bear? It might just be a bit of snow piled up, in which case I really do need to get to Specsavers. 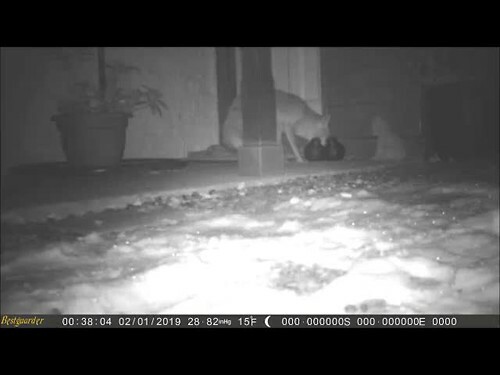 Dave I have only, on cam, a fox interacting with badger. I had put food out around a large Male Fern, and they were circling round the fern - fox keeping an eye on the badger making sure it was at a safe distance. Rowanberry I am one of those people who have odd things dotted around the garden etc. What you are seen on the veranda is a stone dog - on the right and fox is eating out a bowl that has two doves on the rim. I have some stone and some very realistic outdoor plasticy ones - otters, moles, tortoise, a dragon, frogs they are in amid the plants in the borders or beneath stone walls. Around the pond I have a hippo and a turtle. - yes I am mad, but folk do love wandering about looking to see what I have added - kids especially. I've got a few garden ornaments, too... my favourite ones are two pink plastic flamingos an aunt gave me years ago, (they've faded to a very light pink now, but are still in good shape) a ceramic frog and snail, two fish-spitters that don't work but look good next to the pond, and a gargoyle who hangs on the wall. My main weakness are pots- the bigger and more highly glazed the better. If ever neighbours move and leave pots out by their bins for the taking, I'll be the one lugging them home!